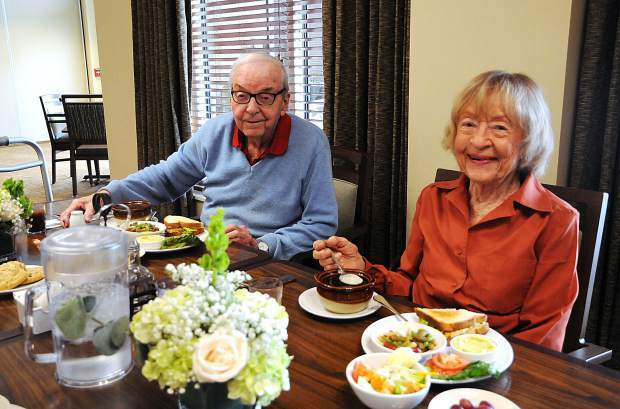 Chuck and Pearl Taylor enjoy a meal at the the Castle Peak dining room. The Taylors are among the first residents at the newly opened senior care facility in Eagle. Castle Peak will host an open house Oct. 7 from 4 to 7 p.m.
EAGLE — With its grand opening celebration planned next week, the first assisted living residents have moved into Castle Peak. “Senior care” has been dropped from the facility’s official name as residents begin the move into the building located in Eagle. Augustana Care, a Minnesota-based nonprofit organization that owns and manages 23 senior care projects, is the project builder and operator. The facility’s 5-acre site is located immediately north of Brush Creek Elementary School in the Eagle Ranch neighborhood. The 62,000-square-foot building will include 22 skilled nursing beds, 20 assisted living apartments, 12 memory care beds and 10 transitional care units. Among the group of Castle Peak’s first residents are Chuck and Pearl Taylor. Married 71 years, the Taylors met in Brighton while still in high school. 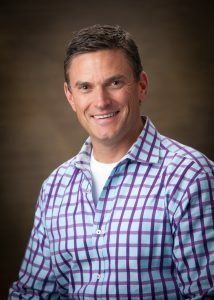 Chuck worked as CPA in Brighton, Boulder and Denver. While living in Boulder, the Taylors enjoyed their vacation home at the Racquet Club in Vail during the 1970s, moving full time to Wildridge in the 1990s. “We came here because we fell in love with the mountains,” Pearl said. For several decades, Pearl was a volunteer gardener at Betty Ford Alpine Gardens. Chuck describes Pearl as a “champion gardener,” and in fact, staff at Betty Ford and Colorado State University (CSU) Eagle County Extension eagerly gathered some of Pearl’s plants and garden art before she moved to Castle Peak. She received a standing invitation to volunteer at CSU. Chuck played golf regularly at Sonnenalp until a year ago and won several tournaments into his 70s. The Taylors’ daughter Kristie Damico said she couldn’t be happier that her parents moved to Castle Peak. Damico said that the timing of Castle Peak’s opening is a “gift from heaven” that is making life easier not only for her parents, but for the entire family. She and her husband both retired in the last few years and are looking forward to moving to Eagle in May. Their grandson and great granddaughters are anxious to visit their “Gigi” and “Grandad” in their new home. Most of all, Damico said she is relieved her parents won’t have to worry about upkeep on their home or cook or shop anymore. They will also have the benefit of additional companionship and activities. “I am beyond grateful we found this community,” she said. Castle Peak Living options include assisted living apartments, memory care specially designed for those with Alzheimer’s and other conditions involving memory loss; short-term rehabilitation that provides time and therapy to recover from illness or hospitalization and skilled nursing for those with chronic or medically complex needs and hospice care. To learn more, please visit http://www.castlepeak.org or call 970-989-2500.